Composer Sidney King returns to Sewanee for the world premiere of his “Tangos Descarados” commissioned by the Sewanee Symphony Orchestra (SSO). “Tangos Descarados” will be performed by the SSO during its concert “¡Concierto! 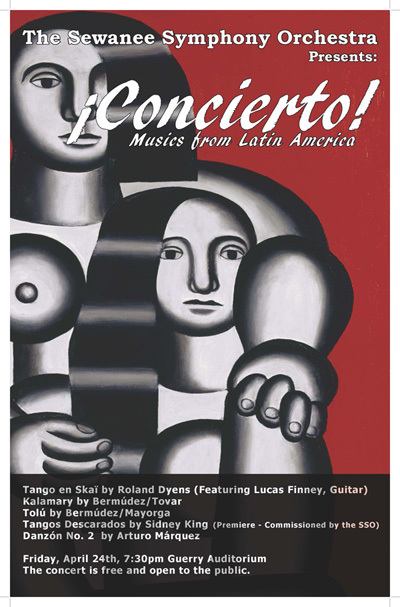 Musics from Latin America” at 7:30 p.m., Friday, April 24, in Guerry Auditorium at the University of the South. As always, this SSO concert is free and open to the public, and free parking is available. Dr. King is the instructor of double bass at the University of Louisville School of Music and the Sewanee Summer Music Festival. The Collaborative for Southern Appalachian & Place-based Studies has awarded a grant to Dr. King and Dr. Cesar Leal (Sewanee Symphony Orchestra Conductor and Assistant Professor or Music) to expand this concert into a fully academic experience by inviting Dr. King to teach master classes open to young audiences and music teachers from the Cumberland Plateau area to illustrate his compositional process and the way in which he uses local musical traditions in his works. These master classes will emphasize the importance of developing an orchestral repertoire that represents cultural shifts, social interactions, and honors the wide variety of musical traditions that coexist in the United States. Particular attention would be given to the process of creating instrumental pedagogic repertoire inspired by folk-like musical genres such as those from southern Appalachia. This is the first step in an ambitious project led by the music department through the SSO. Dr. Nikos Pappas, well-known Fiddler and Musicologist specializing in Appalachian music, has been hired as a consultant to come to the university and evaluate this project and contribute to it. The music department is also working to build connections and collaborations with Yale, and is hoping to work with Dr. Ian Quinn, a specialist in music cognition and American folk hymnody. We look forward to sharing more developments in the future.